When we hear about a watch that will track all sorts of interesting things, we immediately think of something that’s a fitness or activity tracker. Those are very micro-focused, and rely on a connection to a phone. Well, what if you flip the script and go for macro-tracking? If you’re tracking things on a large scale – say, the sun and moon – then you don’t need the phone. 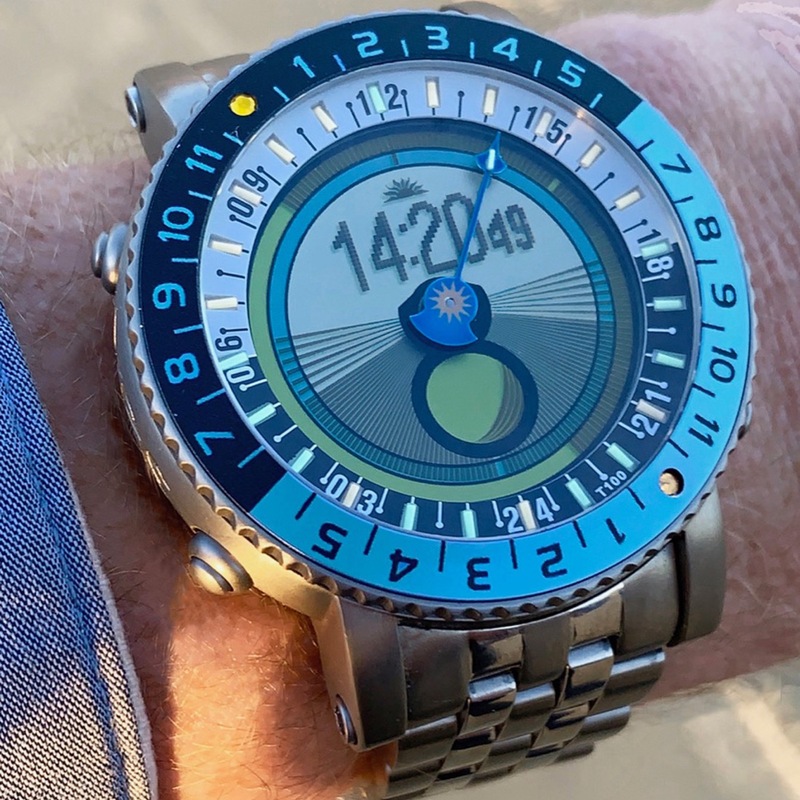 That’s what the newest Yes WorldWatch is offering you – super accurate solar, lunar, and timekeeping, without needing to be constantly charged or lashed to your phone. That’s just a small set of the functionality the Yes WorldWatch builds in – check out the tech specs down below for the full capability. What I put up above, that’s the stuff that really stands out. When it comes to moonphase watches, we’re used to some rather simplistic displays, manually set by you to track the moonphase. Or, you go the super-expensive route to get something that is perpetually accurate (as would be the calendar info) for years upon years. This, the watch just has all the info loaded into it’s chips, and once you set the city and time, it does the rest. Want to know when the sun is going down, and how much of the moon you’ll see? This watch has you covered. Want to know when twilight ends, and it’ll be truly dark? You’re covered. In short, anything you could want to know about the stuff moving in the sky, this watch will tell you. The solar indications are largely done by the LCD screen, which also hides an EL backlight under it – the better for reading things at night. Not only that, you’ve got tritium tubes in play as well, so you’ve got all sorts of fun night lights. Past the solar/lunar stuff, you’ve got the central hand recording 24-hour time (noon at top, midnight at the bottom), and then time, day, and date info is listed in the upper portion of the dial. There’s a lot packed in here, which explains why the case of the Yes WorldWatch is 46mm and 16mm thick. So, yeah, it’s a beefy one. Fortunately, the titanium should cut down on the weight, so you’ll just have to get used to the puck on your wrist. Who’s it for? You super want to know when the sun and moon are on the move. The best thing about it: For how much they’re able to indicate on the dial, just how simple and relatively easy to read it is. Preprogrammed for 650 cities worldwide. Location can also be set by LAT/LON and it has 10 cities always kept in memory. Digital time, LCD display and hand automatically adjusts for Daylight Saving Time and Time Zone. Times for sunrise, zenith, sunset, twilight (all 3 levels) and true midnight. Sunrise and sunset alarm with 0-99 minutes pre-alarm. Equinox, solstice and cross quarter day alerts with event times. Times for moonrise, moonset, moon phase, % illumination plus exact time and date for the next new and full moons. LCD ARC day/night display with twilight. HRS:MIN:SEC in AM/PM or 2400 format. Month, date, day, year and DOY. Regular set alarm with 10 minute snooze, 99 minute timer, top of the hour alarm with user choice of active hour range and 999 day countdown/up. 24 hour stop watch with with lap time and memory measured in 1/100 of a second. Electronic compass with NSEW direction and degree readout. 7 languages: English, Spanish, German, French, Norwegian, Italian and Portuguese. Rechargeable battery. 3 months plus of battery life on one full night of charging. Crisp night time viewing provided by 24+1 tritium tubes on dial+hand coupled with the electroluminescent back light. Unique software time trim allows for adjusting the watch to a +/-0.5 second monthly accuracy. Ronda Swiss Made servo driven 24-hour analog hand. 46x16mm, 22 mm lug nut width, adjustable locking clasp on titanium bracelets. Titanium construction with sapphire crystal to 10 ATM water resistance. Your choice of bezel design, color, finish, bracelet and soft straps. Comes in a sturdy box made for worldwide shipping. Instruction Manual and jewelers tools included. What I really like in this watch is the moon set and sun set possibillities, normally you see one function on the screen, but this watch shows you all the moon and sun information on one screen. I always love moonwatches, but this is something special. Other nice functions you can read in the article. The only thing you’ve missed really is the two colours in two tones. That been silver polished or silver satin & black polished or black satin. Other than that this is a great advert for yet another fantastic watch from Bjorn. I admit to owning a yes-watch Zulu & have today now backed this v7 world watch kickstarter project. Fingers crossed more people become aware of this unique & wonderfully useful piece of kit!